I received quite a lot of mails and comments on why iam just complaining now after so many years.The only way i can answer this question is why did our greatgrandmother,grandmother and even our mothers whose husband beat and humiliate at every opportunity still stays with their men-Kids and the security marriage provides.Girl child in this part of the world are made to belief that their primary role is to be a wife and mother and any other achievement is just be the side and whatever your husband does is right and should never be challenge and you grow up with that notion and when you are face with challenges in your marriage-emotional and physical,you bottle it up as you never want to be seen as a failure and ridicule. I once had a chat with an older friend married to one of the present Governor on how she is able to sustain her marriage for over twenty years and still looking so much in love and she just smiled and said that what we see outside is all a facade as she is a very unhappy woman and that she get beaten at any slightest argument and that can i imagine that her honourable husband had stripped her naked before in the presence of his staff,all because of a mistress and that where will she begin and who will help her with her four kids if she leaves though she has her thriving business and what will the whole world say and all her detractors will have cause to jubiliate-imagine how the society has condition our reasoning .The only advice your mother have is for you to continue to endure for your kids and dont forget,your unmarried friends are looking at you as a lucky person for even getting a husband and that they will take anything rubbish to be in your position but we are all human being,at a point in ones life-all the issues get to you and you want to revolt but in my case,iam not ready to leave my marriage but having a place where i could unbottle my pains and reduce the stress and i keep hypertension away from my life. I trully empathise with you, i know exactly how u feel cos i have been there. i can say confidently that u re are blessed, u are fortunate to be able to fend for urself unlike millions of women who suffer similar or worse fate but cannot even express their feelings cos they are totally dependent on their abuser. u didn't mention if u are a christioan or not, if u are a christian, your problem is solved! i am able to testify today, only because of the glory of God.. this is not preaching at all, only the power of the most holy God can transform a marriage like you have now into a beautiful furfilling one that you desire. you have to break down the enemy's stronghold with love!! just start to love him with all of you..
pray for him, pray for God to open his eyes, soften his heart,protect him in all of his ways, bless and prosper him etc. just plain old seeking God for yourself.. once you find the peace of God that surpasses all understanding, the spirit of God will guide you along. once you are at peace, your demeanor will be so drastically changed, so much that your husband will definitely notice. your husband is a victim of his upbringing and should be pitied..
u have to understand you both have divergent ideas about love and marriage, when u show him love and affection despite his ways only then can you reach him. he feels u don't need him, but u do. u need to let hom u need him to love and cherish u just like u are doing. (it a big crush to a man's ego when u tell him u r tired of his ways)he needs your love more than ever!especially coming from polygamous home. 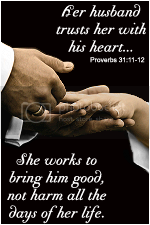 do this in obedience to God, not as a means to hold on to ur marriage. be a vessel that will bring the love of God into that man's life..
i'm very glad to make ur day.i understand exactly how u feel,it was def a divine revelation when i realised that my hubby just felt unneeded (and that translates to a man as "useless")i adjusted my attitude accordingly.a man especially african, want to feel needed and important in their marriage/relationship. some call it "ego stroking"i call it nurturing. anyway,once a woman finds peace within themselves then, they will be able to withstand the storms of marriage or any storm for that matter..
i have a feeling we will be talking more..
Nijawife... You can not discontinue this blog... Women especially African women, in this case Nigerian women need to hear this..
just plain old seeking God for yourself"
...so weldone again @ anonymous I pray and know that all you have said will bring healing and most of all wholeness! Nijawife... you see there is a purpose for everything... even pain! that is for only a season. What is wrong with you people? what kind of advice is this? Emi, or whatever your name is ehhhhhhhhn, so na so! Misery indeed loves company! Be using chritianity to cover up! So you want her to suffer just because you too are suffering? I see you really "love thy neighbour as thyself"! and you, nigerwife, if you like, be consoling yourself that there are other women around Nigeria suffering, yes, its true, but there are also millions of women that have fulfilled marraiges! i see you have already chosen your path, Misery! anyway, goodluck! Iam a wife,working mother of four.My life revolves around my family.Iam ever happy despite the challenges of life.